Have you tried matcha powder? Matcha powder is made from green tea leaves. It contains many health benefits. Matcha powder is high in antioxidants, can help improve memory and concentration, increase energy, boost metabloism and detoxify the body. I have been wanting to try matcha, so I was happy to get an opportunity. I used Kiss Me Organics Matcha Powder . Their matcha powder is organic, vegan and gluten free. You can do all kinds of things with this matcha powder. Smoothies, lattes, baking and raw desserts. I am thinking about making a matcha ice cream next! These matcha truffles are delicous. Who wouldn’t want a truffle with antioxidants? Seriously? Win! 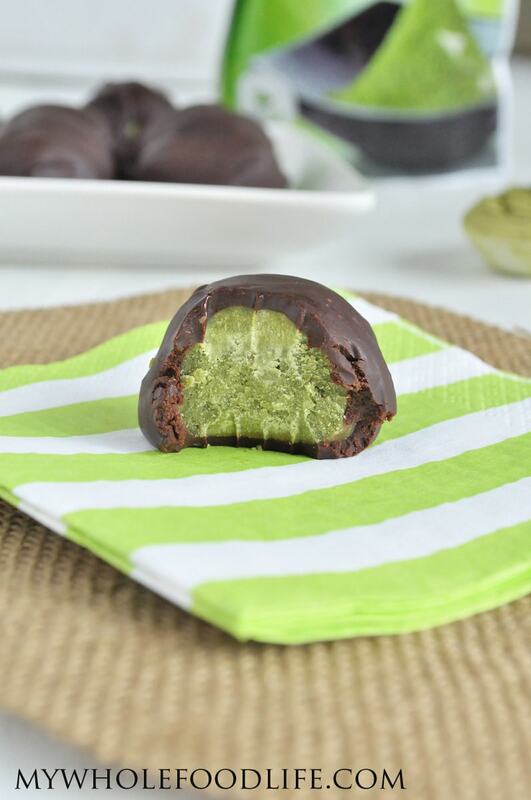 If you like these matcha truffles, you may also like my strawberry cream truffles. 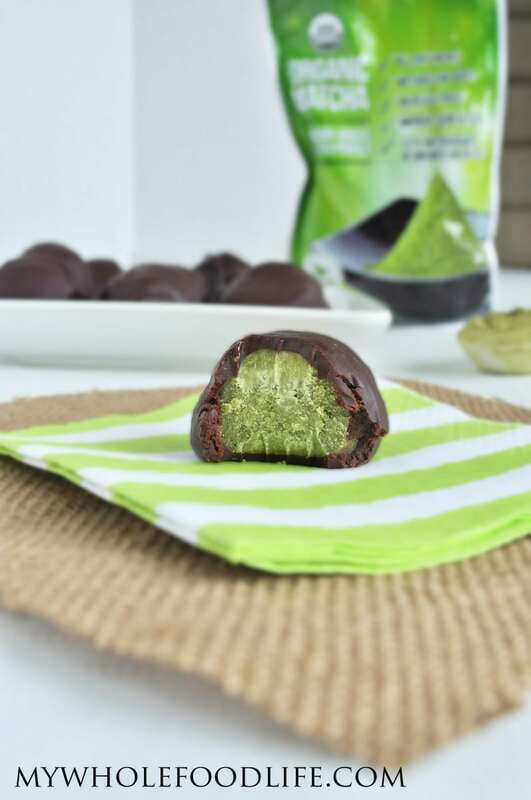 These matcha truffles were seriously so good! Melt in your mouth with hints of green tea. If you are already into green tea, then you will love matcha! If you make these with dark chocolate chips, you will also be getting the antioxidants from the chocolate! Bonus! 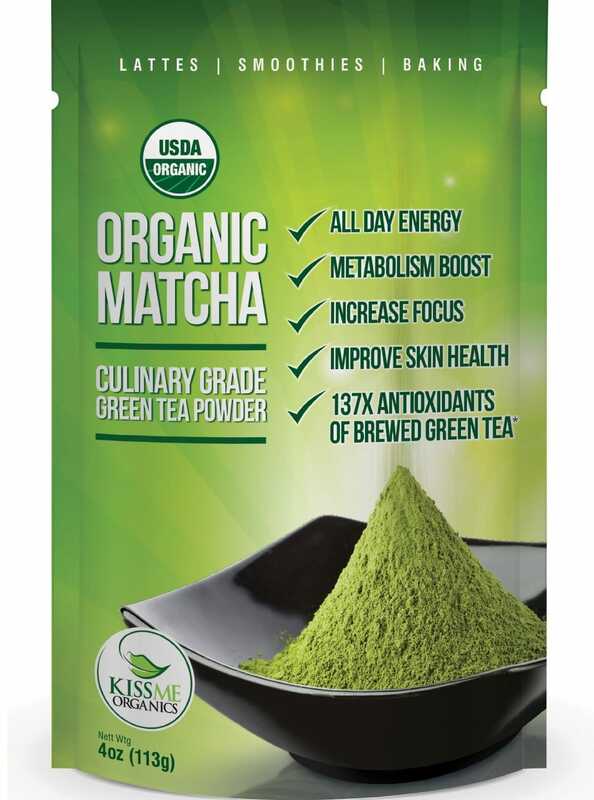 I have even more good news, Kiss Me Organics is going to give 1 bag of matcha powder to one of you! A sweet treat with a boost of antioxidants! In a food processor , combine the filling ingredients. To make the chocolate coating, use a double boiler method to gently heat the chocolate. Place a glass bowl on top of a pot of boiling water. Add the chocolate and almond milk to the glass bowl and gently melt into chocolate. Once the chocolate is melted, you can roll the balls into it. I like to use two forks to help guide the balls around in the chocolate. Once all the balls are covered in chocolate, stick them in the fridge to firm up. It should take an hour or two. If you want to firm up the chocolate faster, you can stick them in the freezer. Please keep these stored in the fridge. You can also freeze them for longer storage. Enjoy! Disclosure: This post was sponsored by Kiss Me Organics, but all opinions are my own. These look so tasty! I can't wait to try out this new twist on a classic truffle. Thanks for sharing! I'm sorry you are frustrated, but you can always upload the recipe into my fitness pal for a breakdown. I am not a nutritionist and I'd hate to have my calculations be wrong when it comes to a diabetic.